Floral Accents is based just outside the beautiful old market town of Reigate on the edge of Surrey, bordering Sussex. We are ideally located for excellent access to the M25 and M23, as well as a lot of major A-roads, making us well-placed to serve Surrey, West Sussex, East Sussex, Kent and Hampshire. We are also happy to travel further afield should you require us to. 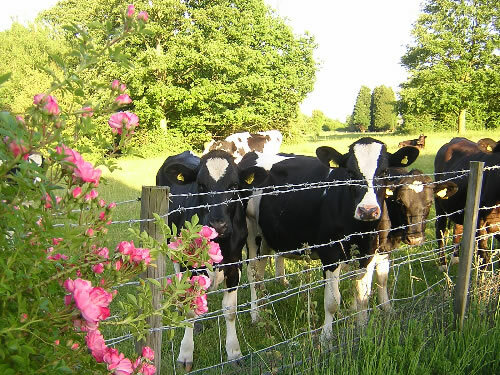 Our workshop is situated in the beautiful Surrey countryside overlooking fields. Although we are close to all the major routes, we tend to only have the local farm’s cows and native birds for neighbours – oh, and the odd deer or two who take great delight in eating our tender lilac bush when we’re not looking! We find that the location of our premises means that we can spend quality time on creating beautiful and stunning floral designs without the normal every-day distractions. And this is important to us – we take pride in our work and want to provide stunning flowers each and every time. The view from our workshop.